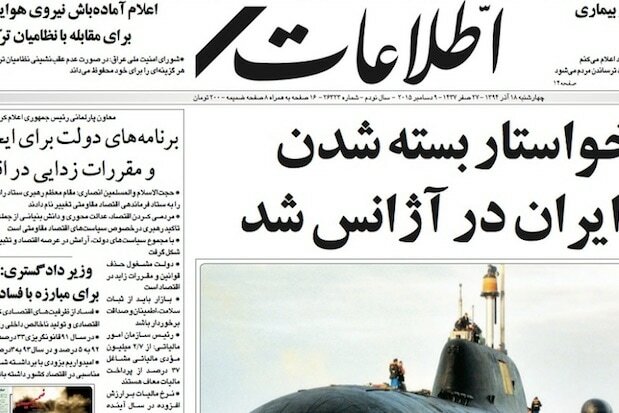 An Iranian state-run newspaper wrote an unprecedented front page editorial on Wednesday criticizing the Iranian government’s censorship of the media that prohibits the acknowledgement of former president Mohammad Khatami. Iranian authorities imposed the ban on mentions by name and images of the reformist ex-president, who supported opposition leaders, in February. But Ettelaat, a state-run paper that typically resists taking positions on tense political issues, condemned the restriction in a front-page editorial on Wednesday. Editor Seyed Mahmoud Doaei, a reformist cleric, wrote the editorial in the form of a letter to current Iranian President Hassan Rouhani, urging him to end the ban. In the process, he mentioned Khatami’s name three times. “The esteemed prosecutor of Tehran held a meeting with a number of managing editors including myself recently, in which he demanded us not to publish articles or images relating to Hojatoleslam (an Islamic honorific title) Khatami,” Doaei revealed. “I told him in that very meeting that this decision is arbitrary; there is no legislation or law backing it and that Ettelaat would not accept it,” he continued. This isn’t the first time Iran’s leadership has implemented a ban on Khatami’s name or likeness, having done so back in 2010.